Guess that lately I am so lucky that I won a few prizes including quiz and competition. Haha. That's the joy of twitter, anyway. 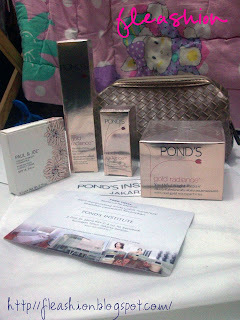 So this time I was so lucky to attend GRAZIA Day with POND'S on 14th of July, 2012. It was held at The Pond's Institute, which luckily located near my residence. My skin is combination type where the T-zone is oily and U-zone is dry. Unfortunately, my U-zone is almost dehydrated. I don't know why since I don't spend most of my time in air-conditioned places and I always apply moisturizer day and night. She said that I should wear more moisturizer. My skin elasticity is still very good, that's the good of being young haha. She said that though I have visible smile-lines, I don't have to worry much about that since there are few people who was born that way (it's not wrinkle). The dark spots are not found yet on my skin's surface, but when she checked the deeper layer of my skin (which is underneath the outer layer of my skin), there are so many dark spots potential. She advised me to always wear sunscreen in order to prevent the dark spots to show up earlier. Overall, she said that my skin condition is still fine. I just have to stick to my daily beauty routine of always applying moisturizer and sunscreen. Yay, so happy! After the skin check, we were escorted to enjoy the brunch. Yum, the food was so delicious. After enjoying enough brunch, the MCs invited us to sit down and join the main event, which was the talk show by dr. Eddy Karta, SpKK. He talked about skin aging, he was so funny and communicative, lots of joke during the session. After that, there was two more talks by Unilever's representatives and Grazia's fashion director; Monik. And, there was doorprize announcement and some mini games. I bet that most of you must be familiar with Grazia's signature games; Fashion Sudoku. So, me and my friend joined the Fashion Sudoku, but we didn't win. Still, Grazia was generous enough since they gave us a gift, too. Then we went straight upstairs to enjoy free facial treatment by Pond's. We chose the facial room for two. Haha! Perfect for friends like me and Reni. The interior is nice and clean though. The therapist said that my treatment will be done with Flawless White series which is designed for young woman under 30. The other two; Age Miracle and Gold Radiance are supposed for the older women who are more than 30 and for those who concern about early signs of skin aging. So, the therapist said to me that we could only enjoy the regular facial treatment, not the fully one since the time was not enough. It was my first time for facial, anyway. I was so excited! The treatment began with the cleansing, then followed by scrubbing, application of mask, serum, and moisturizer. I felt like I was born again! Hahaha. Unfortunately, my friend did not feel the same. She has extra-sensitive skin that when the therapist was applying the mask, she felt like her face was burnt. Oh, poor you, my dear friend. She has talked to me that her skin was irritated when she tried using Pond's before. I gotta say that I feel my skin was so soft and glowing after the treatment. I love the mask, but forgot to ask the therapist about that since as far as I know, Pond's does not have any mask product. The eye serum, which I believe to be the Flawless White Series, was also feel so good on my under eye area. 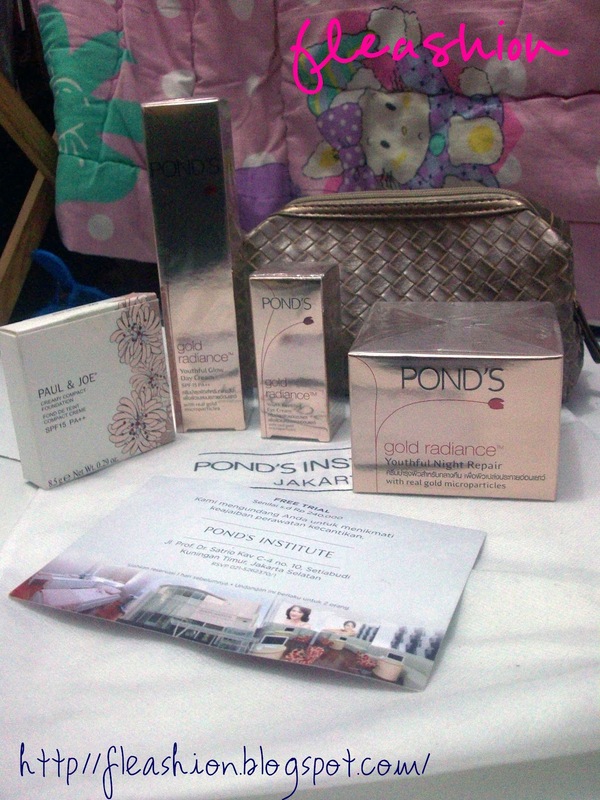 Overall, I love this treatment by Pond's. So that's the end of it! Actually this facial treatment was only available for the first 20 people who re-registered, the other 10 can come back and make a reservation for free treatment, but not that day. There was also a nail art service but I was in hurry so I did not try that. Hehe. Of course, there is a goodie bag from that event and some freebies (from joining Fashion Sudoku and being the earliest attendees!). Here it is! I guess that's the end of it. Hope that I can join another exciting event like this. And I also love the Foundation, hihi. i give you an award..